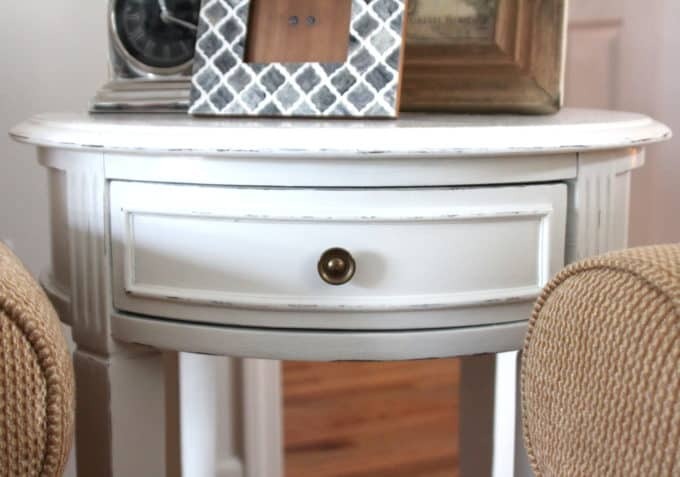 2 | making older furniture feel a little more current. This post contains affiliate links for your convenience. Read about affiliate links here. 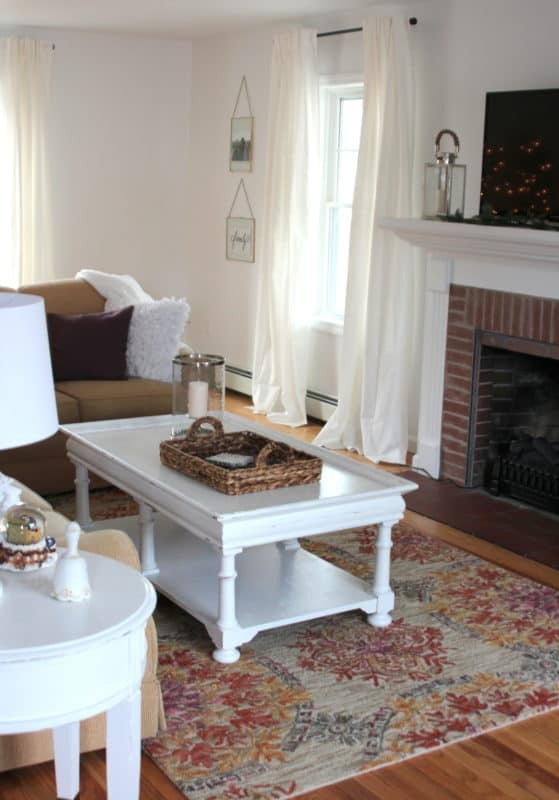 Kim and I brainstormed about every last item that we’d love to see in this space, and then over the fall we worked on procuring items for the room. The jumping off point was the couch and loveseat, kindly donated from an estate sale. They are not exactly the most current style, BUT! they are neutral (woohoo!! ), clean (!!) and in great shape! Nothing a few new pieces couldn’t help to update! Most of the budget we had to work with – thanks to generous sponsorship by Hometalk – went towards the TV (a wish from the family that we were so happy to fulfill! ), window treatments that offer privacy and soften the space (these curtain panels and rods), adorable and affordable purple chairs (the homeowner’s favorite color), and a few Homegoods finds like the small wooden table with hairpin legs, art and accessories. To finish off the space we needed some tables for the couch and loveseat area. 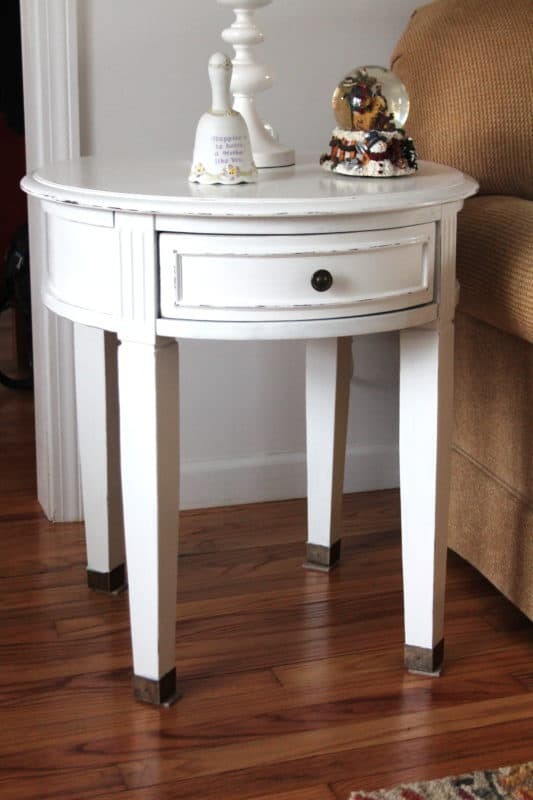 Do you believe Kim found two of these little round end tables, in excellent condition, on the side of the road?? Someone had surely left them there for a lucky person in need to find. Such a generous act of kindness! 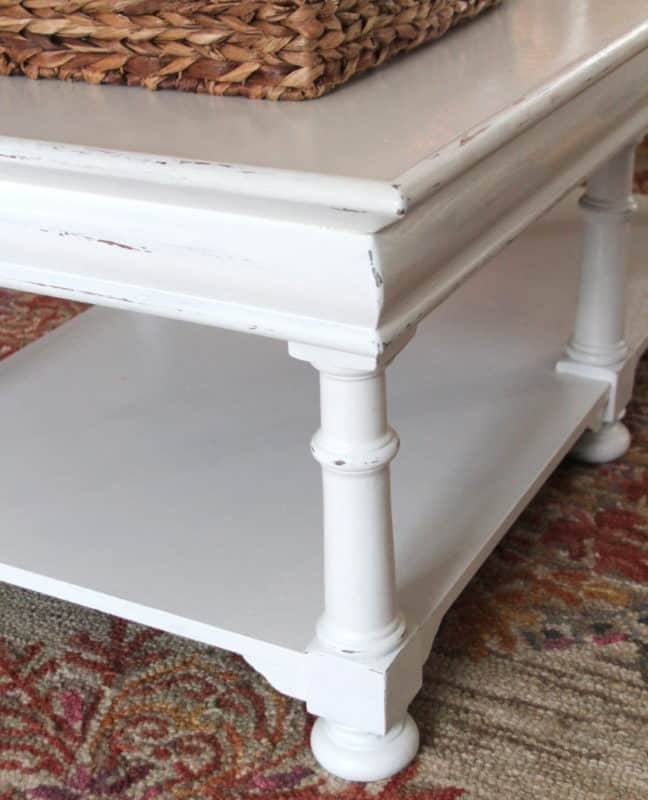 The tables were in great shape, but for the Habitat project we wanted to keep the space light, airy and a little more casual than these traditional pieces, so – and I know this is going to pain some of you – I painted them. They weren’t high quality (the sticker from the discount store they hailed from was inside the drawer) and painting updated them so much! 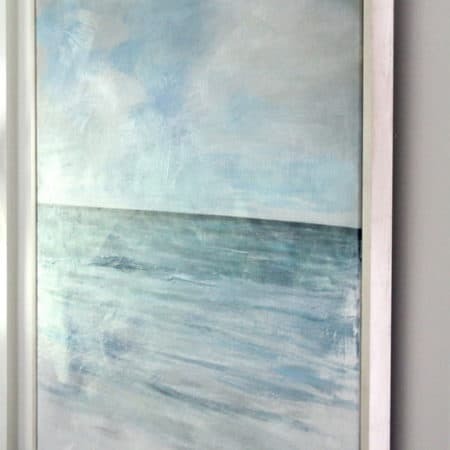 The homeowner had put together a Pinterest board so we could take a peek at her style, and we knew she loved a bit of a rustic look, so I also lightly distressed the tables after painting them. I love the patina of the brass leg caps! I brushed on Amy Howard At Home One Step Chalk Paint in Bauhaus Buff, the same color I used on the base of my newly limed oak table. I was hoping to get away with two coats but the tables really needed a third; the coats did dry quickly though. After they were fully dry, I went along the edges where normal wear might happen over the years with medium grit sandpaper. Instead of waxing, I opted to seal these tables with clear satin Polycrylic so they could really take a beating without needing to be sealed again anytime soon. 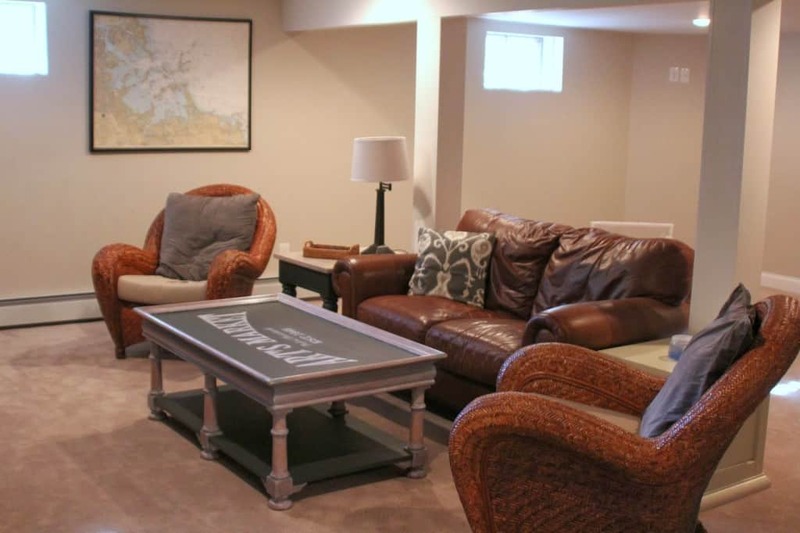 We also needed a coffee table and as luck would have it, I had one in my basement that we weren’t using anymore! Do you remember this piece? 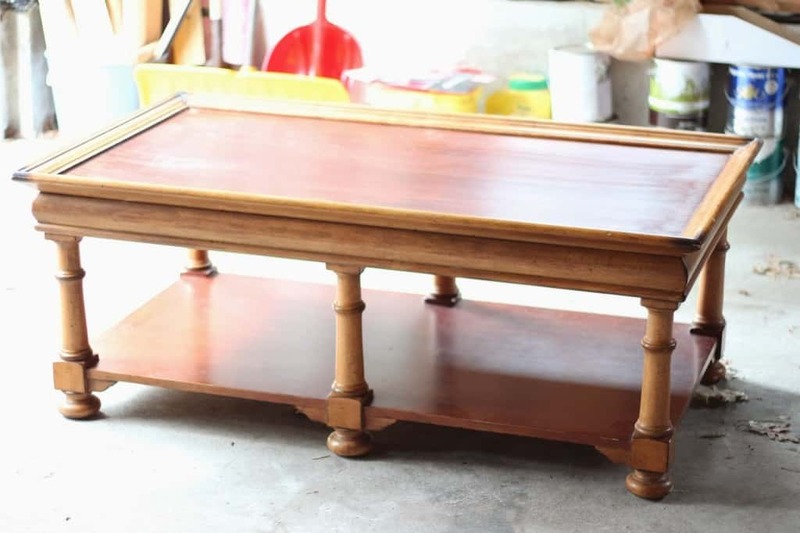 Over time we moved our huge ottoman coffee table down to the basement (perfect for this space because it’s on casters and easy for my kids to move out of the way for sleepovers and dance parties) and the Art’s Market table was ready for a new home. 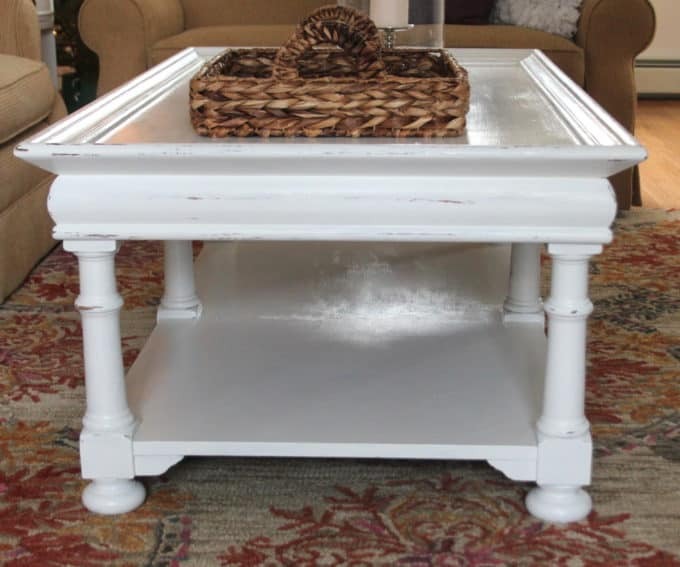 It’s such a heavy, well built piece and it was perfect for the Habitat house after a chalk paint job. The satin Polycrylic is a bit shinier than I prefer but it gives the tables a hardwearing finish, and it doesn’t yellow over time. I use it on all my white painted pieces. Hopefully this table will serve the family well for board games and movie nights and memory making through the years! 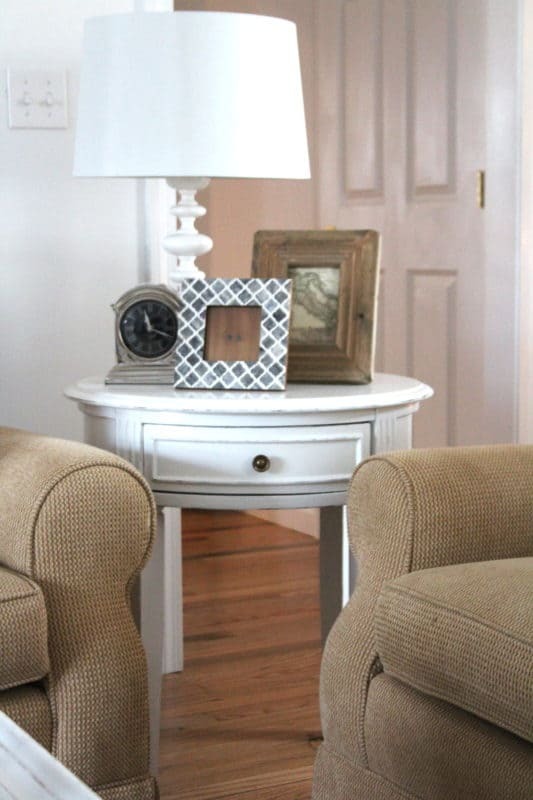 Making a cozy space that is fresh, cheerful and a reflection of the homeowner’s style were our goals, and it was a joy to see this family’s happiness when they walked into the rooms for the first time! 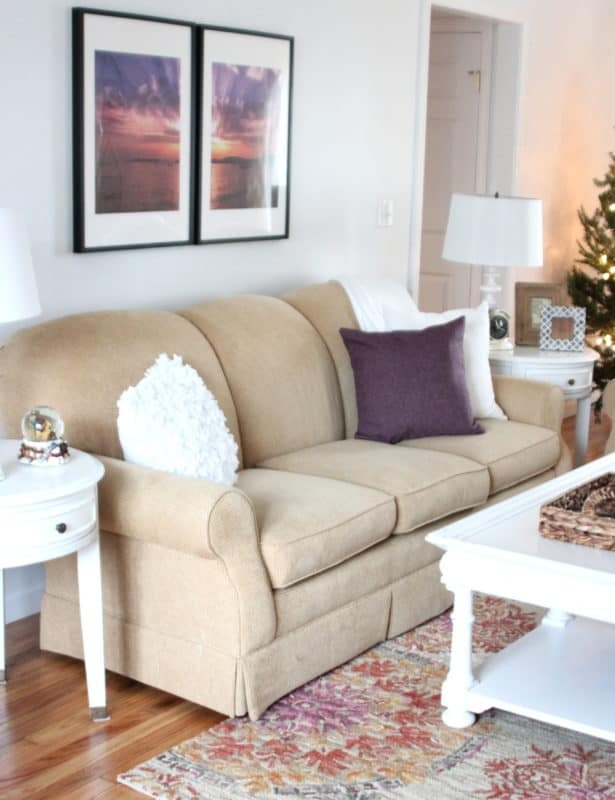 If you are working around an outdated upholstered piece like a couch or chair, consider freshening it up with a solid, light colored throw blanket and pillows. 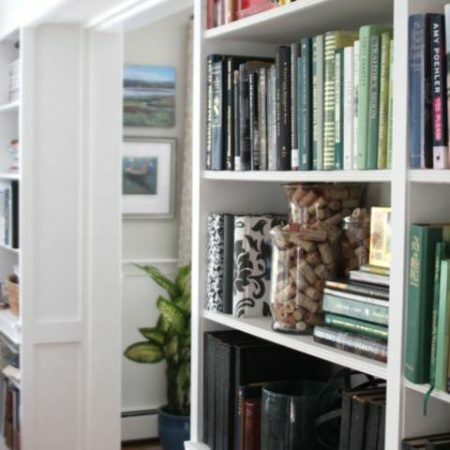 White walls are not only on trend at the moment, they also make a space feel new and clean. 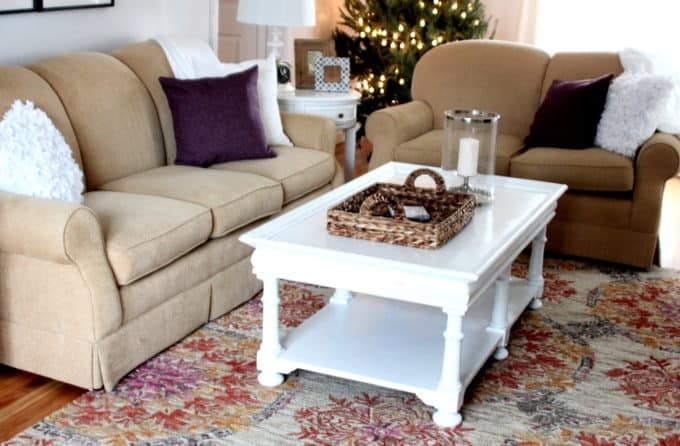 While buying a whole matched set of furniture is out of vogue, if you have a hodgepodge of furniture in different styles, try painting them the same color to quiet them down and bring the room a little cohesiveness. On Thursday I’ll share the easy art I made to work with Kim’s rug and tie this room all together! 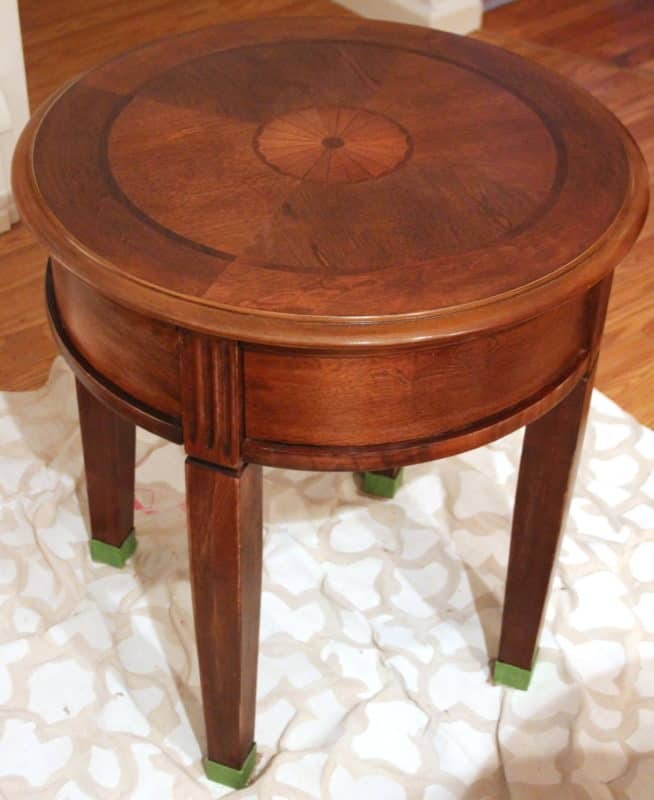 Visit the Furniture Projects Gallery for more makeovers! What an amazing job you did, and no doubt the homeowners were delighted with the results!! I love that rug and the purple chairs, they really bring the room into 2017! You are the sweetest Debbie, thank you for your kind words! 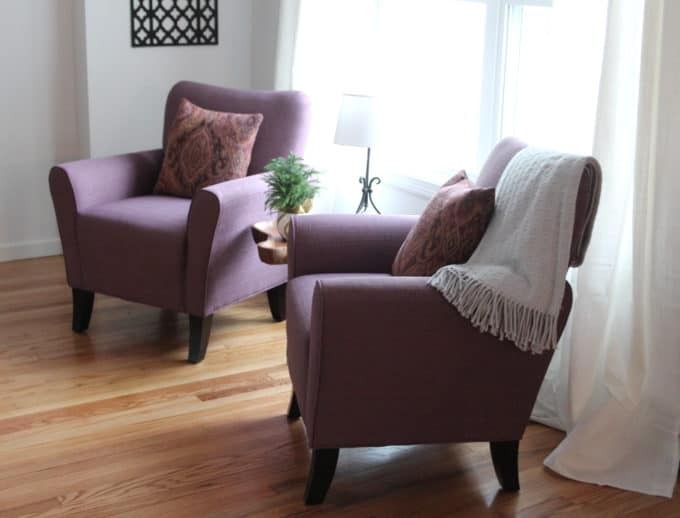 Kim picked out the chairs and they really are so cute and comfy in person – perfect for that space!